The following ideas are just five of many examples which could be employed to reinvent teaching in lectures. Each are based upon the Echo360 active learning platform which integrates the affordances of video technology with engagement tools and learning analytics to enhance level of student engagement in a lecture, and blurs the physical and temporal boundaries of the traditional lecture to give students a more personalised and flexible learning experience. Encourage conversation. “I know that learning is really successful when the lesson finishes and the conversations continue” (Abdul Chohan, Director of Development, Essa Academy, and keynote speaker at BETT2017). Here are a few ways to encourage such conversation. Give your students the opportunity to ask questions and respond to each other, either at natural breaks in the teaching or following an interactive quiz. Systems, such as Echo360, allow students to post anonymous questions, giving greater voice to those less confident. Encourage students to continue the conversation online through the discussion forums in their active learning platform or LMS/VLE. Give teachers real-time analytics about their teaching. 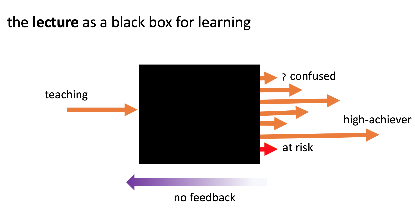 The challenges presented by teaching at scale leaves the lecture open to criticism that it is a "black box model" of teaching; teaching is seen to occur, and learning is evidenced by assessment results, but how much learning is occuring is unknown to all. The diagram below illustrates hot the teacher has no clear understanding of the level of attention or learning from the students. Feedback is only available much later in the semester from coursework grades or exam results. 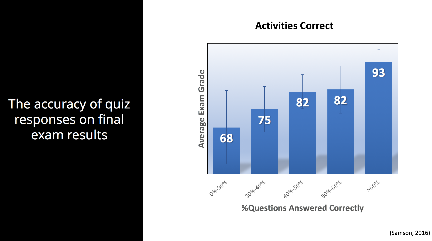 Provide immediate insights into the level of student engagement in a session, as data provided directly to the teacher about the number of page clicks, questions responded to, questions answered correctly, and if any student is confused. This is available through an online summary graphic, which can be reviewed during the lecture, or following it. It can also be used to evaluate longitudinal trends in student engagement from lecture to lecture. Using these tools, students can respond anonymously and immediately compare themselves with the rest of the group. The results may be unexpected for the teacher or students, thereby offering scope for discussion between the group. Research from Perry Samson at the University of Michigan (2016) suggests that responses may also be a useful indicator of likely success in exams, highlighting the value of early, low stakes, testing on whole student cohorts. Flip, and ‘flop’, your lecture. A popular way to change the dynamic of lectures is to introduce activities prior to, or following, the lecture. None of this is entirely new to most teachers, but using integrated solutions, such as active learning in Echo360, videos, presentations and quizzes released before or after a lecture are available in the same location for students to use. 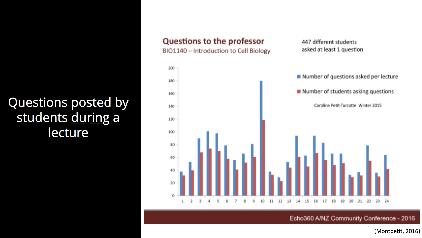 Similarly, all engagement data from students and quiz responses are immediately available to teachers, offering rich information to structure the lecture around. 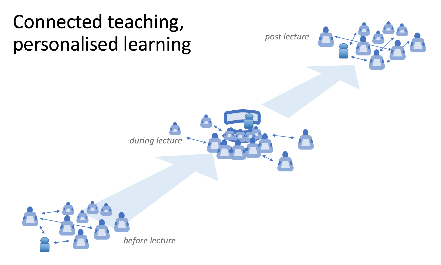 This continuum of teaching and learning, illustrated below, connects the teacher with students at every stage, and is entirely customisable for each teacher and each lecture. Include off-campus learners in the lecture. Engaging with GenerationZ learners and changing workplace demands requires a change in the teaching delivery model from Universities. It may not be possible for all students to attend every lecture, as often they may have family or work commitments, be on placement, or are absent due to illness and should not be disadvantaged from missing a teaching session. Video recordings or a friend’s notes are very helpful, but live streaming of lectures now provides access to a comparable learning experience for off-campus students. By reinventing the lecture, we can build upon the established framework of conventional teaching - the staff, students, teaching, and environment - ensuring that training for staff is minimal and that changes can be introduced at a pace best suited to the institution, course or individual lecturer. By offering connections for pre- and post-lecture interaction, and for learners off-campus, it introduces new opportunities for teachers for engage with their learners and for institutions to offer more flexible pathways into education. Reflecting upon my experiences at BETT 2017 it is clear the whole education sector is reorganising itself to face an uncertain future. However, technology was shown to be a driving force to inspire the next generation through its ability to connect people, learning and data more effectively. I am grateful to all the presenters and contributors at BETT2017 who gave their time and expertise so generously at the conference. Much more about the event is available to find at the conference website and on twitter (#BETT2017). A copy of my presentation is also available at Slideshare.